If you ask us. Snakes have a bad wrap. Yes, they don't have legs and that's a little weird but that doesn't make them any lesser than the rest of the animal kingdom! It all started in that lush garden when one snake (out of many!) started making culinary recommendations. And ever since mankind has blamed these scaley beasts for everything! Their name is synonymous with being sneaky but they are one of the only animals who will give you ample warning before striking. The rattlesnake's rattle isn't there just to entertain restless baby snakes, after all! And the hood that the cobra flaunts isn't simply there as a fashion statement. It's meant to say, "Hey, back off. I'm slitherin' here!". We think it's about time that we cleared the snake's name and allowed them a little more respect. 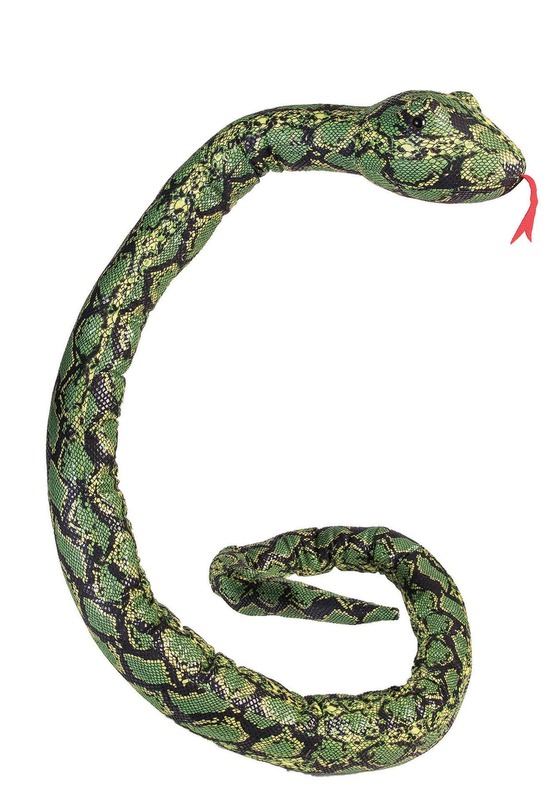 Maybe this posable snake is the first step! Whether you have a major case of ophidiophobia (fear of snakes) or you're more of the ophidiophilia type, you'll feel closer to these scaley legless earthlings when you've got this cute little guy in your house. This fella has a shiny finish, a posable body with a wire on the inside, and a sculpted head with a bright red tongue. Put this verdant beast out for Halloween and you might just want to keep him around because of his sweet vibes. It's about time we stopped walling off reptiles and let (a toy version) into our homes. Curl this little one around a bowl of apples for an ironic feel. Integrate it into your costume for a reptilian celebration. The options are limitless so have fun and let loose. That's how snakes slide!